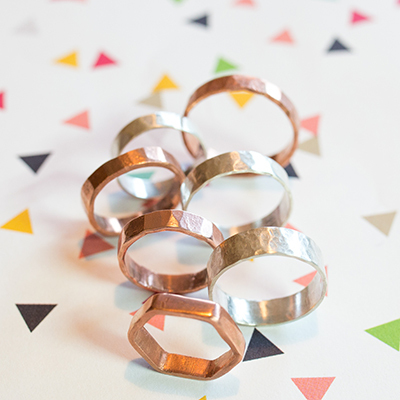 This week I sent my questions to local designer and metalsmith, Kristine MacDonald. 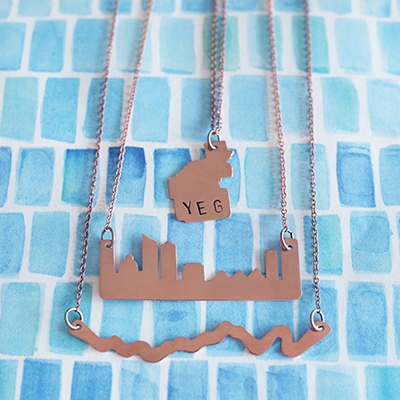 Her Alberta-inspired jewellery is unique and recognizable, and is making a big splash here in Edmonton. We met on a dragon boating team 3 years ago and I've loved watching her business and artistry grow. I work with copper to design and create custom jewelery and accessories. I am also a freelance web and graphic designer. Yes absolutely. I love to create and I love to do. I have dabbled in just about every type of hands on art and design from digital to pottery to painting. My parents have always supported my love for crafts and being weird which is probably a large part of why I’ve always felt comfortable pursuing creative pathways. I had no idea what “metalsmithing” would entail, but I knew I was interested in working in a material which could be manipulated by hand but was still so concrete. I began taking silversmithing courses on a weekly basis at the City Arts Center and really enjoyed it. I had a great instructor and the studio had just about every metal working tool I could imagine. Slowly I began collecting all the tools I would need to do it in my own workshop and eventually began selling my work at markets. It’s been a little over four years since I started. When people come to me with an idea for a custom piece, I usually have no idea what they are imagining in their minds (and often neither do they). So I do a few quick sketches or create some options in digital form and run it by them. I love it when people send me their own reference photos! Once we’ve gone back and forth a few times, I travel out to my workshop and begin work on the actual piece. It’s always great to see peoples' reactions in person when I give them the final product. It may sound cliche, but my inspiration usually comes from nature or from being in nature. Having grown up on the prairies a lot of the pieces that I make are of animals, objects or landscapes found around Alberta. As with most very small businesses, my struggle is against time. I’ve spent the last three years in school full-time and usually working a part-time job on top of trying to run my own business and create all of the product for it. Sometimes it’s hard to prioritize when you enjoy everything that you’re doing and don’t want to give any of it up. Don’t try to force it. If I’m not feeling creative I’ll usually just clean up my space. Then like Jillian Jiggs I’ll look around and be like “Wow! Look at all these sweet supplies and tools!” And mess everything up again creating something new. One thing that really hinders my creativity is making the same thing over and over again. It begins to get repetitive and boring until I have to do something else. That is why I love custom orders! I am actually really excited to start designing a piece that my Mom requested. It’s going to be a necklace much larger than the scale I usually work on which means I can add a lot of detail with my saw. It is going to be very organic and take inspiration from natural shapes like coral, pinecones and rocks. You can find Kristine at www.kristinemacdonalddesign.com, on Instagram, Facebook, and Twitter.